If you're all about practicality dressing when it comes to your personal style, you'll love this chic pairing of a RtA emmet jumper from farfetch.com and navy sweatpants. If you're all about comfort dressing when it comes to your personal style, you'll love this chic pairing of a RtA emmet jumper and black ripped skinny jeans. Look at how well this getup is complemented with white leather low top sneakers. If you're on the lookout for a casual yet stylish ensemble, wear a grey crew-neck sweater and navy skinny jeans. Both pieces are totally comfy and will look fabulous together. Throw in a pair of black leather knee high boots to va-va-voom your outfit. If you're a fan of relaxed dressing when it comes to your personal style, you'll love this uber cute pairing of a RtA emmet jumper from farfetch.com and blue ripped skinny jeans. Take a classic approach with the footwear and make beige leather pumps your footwear choice. 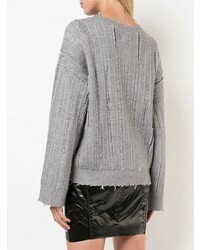 If you're looking for a casual yet absolutely chic look, go for a RtA emmet jumper from farfetch.com and a grey wool midi skirt. Both garments are totally comfy and will look fabulous paired together. 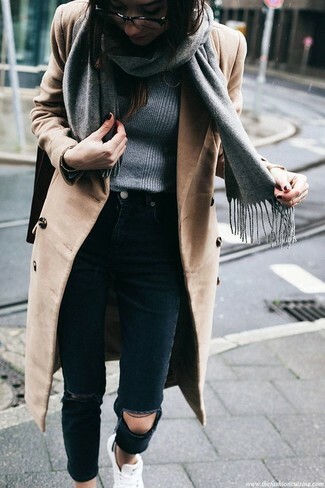 Let's make a bit more effort now and grab a pair of beige leather pumps. Make a RtA emmet jumper and a black skater skirt your outfit choice if you're hunting for an outfit idea for when you want to look casually cool. Let's make a bit more effort now and make black suede pumps your footwear choice. A RtA emmet jumper and a pink midi skirt are absolute staples if you're figuring out an off-duty wardrobe that matches up to the highest sartorial standards. Got bored with this look? Enter silver leather ankle boots to switch things up. 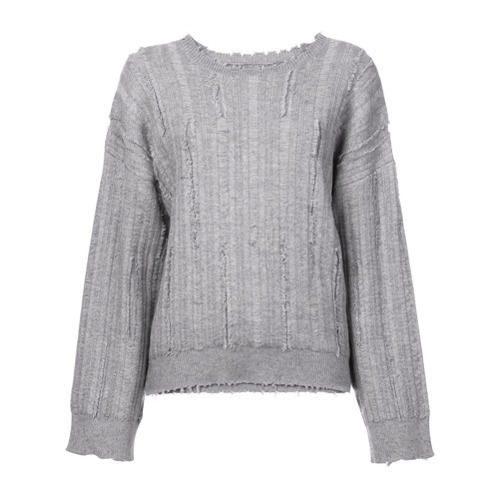 If you're in search of a casual yet chic outfit, try pairing a RtA emmet jumper from farfetch.com with navy skinny jeans. Both items are totally comfy and will look fabulous paired together. You could perhaps get a little creative in the footwear department and lift up your outfit with black suede over the knee boots. If you're on a mission for a casual yet totally stylish look, opt for a RtA emmet jumper and blue skinny jeans. Both pieces are totally comfy and will look fabulous paired together. You could perhaps get a little creative when it comes to footwear and lift up your getup with silver leather ankle boots.